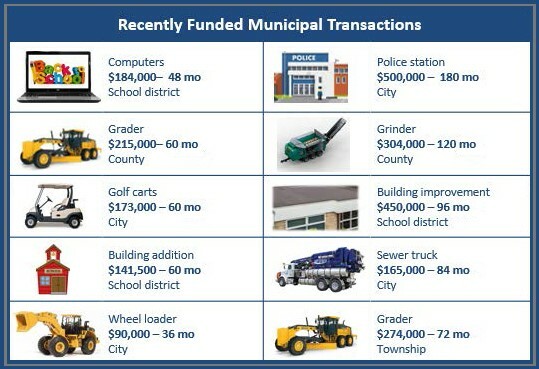 Kinetic Leasing is contracted by CPC to provide lease financing to the public sector including: county and city municipalities and schools. Kinetic Leasing offers equipment and services financing from $5,000 up to $5 million. There is a no-cash-down option with 100% of the project financing. Visit Kinetic Leasing's page on the CPC Website! Established in 2000, Kinetic Leasing is a general equipment financing company with offices in Marshall, Minnesota, Fargo, North Dakota and West Des Moines, Iowa. It specializes in providing flexible, creative leasing solutions to schools, cities and counties for both new and used equipment. Kinetic Leasing has financial partnerships with more than 250 banks in the Midwest. Local government, schools and nonprofits are eligible for the value and cost savings provided through this partnership. Requests for Proposal (RFP), conducted by CPC, satisfy the competitive solicitation process in Minnesota, South Dakota and North Dakota. Thank you for supporting CPC. ﻿You are receiving this email because you are a participant of the Cooperative Purchasing Connection with SWWC Service Cooperative.